After having nailed — if I do say so myself — how to make homemade goat cheese chèvre style, my confidence as an amateur cheesemaker has soared. In fact, for the past few months, every time I open the fridge, I can hear the collective gasp of all liquid dairy products. And they’re right to tremble in fear; my refrigerator has become the place where milks and creams from different animal species come to curdle and age. Homemade cream cheese is my latest project. Boasting freshness, creaminess, and a bit of tang, freshly-made cream cheese has completely ruined me for commercial cream cheese. Admittedly, in things such as cheesecake or other baked goods, wherein cream cheese is baked along with other ingredients, the vast difference between commercial cream cheese and homemade cream cheese is not so obvious. However, when cream cheese is served as the main — or sometimes sole — ingredient (e.g. as a bagel spread or in a dip), quality counts tremendously. And this is when knowing how to make your own cream cheese comes in handy. I got help from Chef Grégoire Michaud‘s latest book, “Got Cheese?” His method is foolproof, easy, and produces stellar and consistent results. 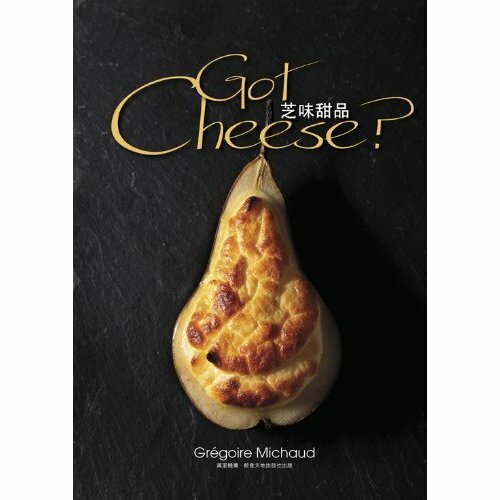 Chef Michaud’s bi-lingual (Chinese and English) book contains instructions on how to make simple cheeses, including cream cheese, at home as well as how to turn them into spectacular desserts. Warm up the milk and the cream in a large nonreactive pot until the temperature reaches about 70°F (~21°C). Don’t let the mixture boil. Add the veal rennet and keep the cream mixture covered at room temperature overnight. The next day, the mixture will have set. Sprinkle the salt all over the surface. With a large wire whisk, cut the gelled mass into small curds. Line a large colander with a piece of muslin cloth and place the colander on a bowl large enough to hold the whey. Gently pour the content of the pot into the colander and let it drain for about 30 minutes. Gather together the corners of the cheesecloth and tie them together with a rubber band to form a bag. Empty out the whey that has collected in the bowl*. Place the colander, with the cheese bag in it, back on the bowl. Put the whole thing in the refrigerator and let the curds continue to drain overnight. The cream cheese is ready to use the next day. *Replace the water in your yeast bread recipe with this fresh whey (obtained within 24 hours of cheese curdling) for extra delicious bread. 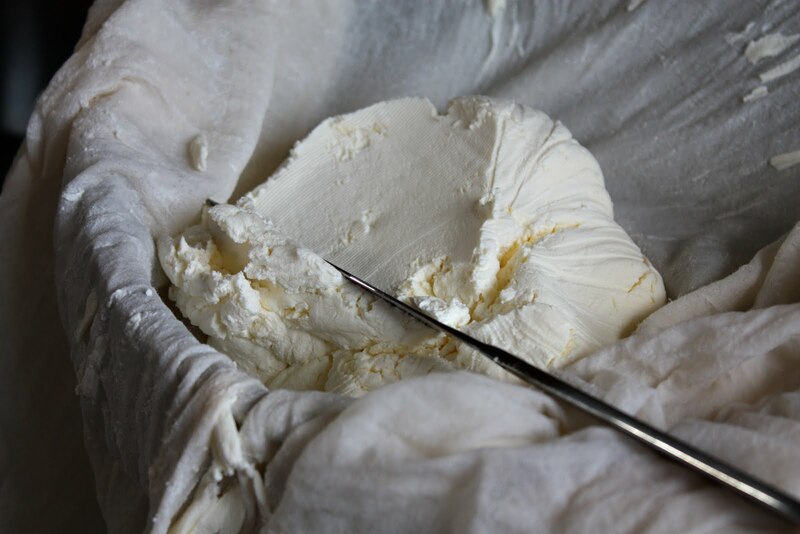 We’ve been making our own cream cheese recently as well. I really like how it differs from commercial cream cheese – it just tastes more “creamy”. I am in awe. I never thought cream cheese could be made at home. I’m sure this beats the store bought stuff anytime! Do you think this is more cost-effective, Leela? i was wondering what you meant by non reactive pot? Well done. I would absolutely love to make this, but no rennet here…alas! You can make a reasonable cream cheese using just milk, heavy whipping cream and vinegar. Gently heat milk and cream to just below boiling (180F is good) , stirring continuously. Stir in vinegar and lemon juice, remove from heat. Strain through tight cloth in strainer over bowl, at least 15 min. Hang to dry 4 to 12 hours. Will keep for about 2 weeks. You just described how to basically make Ricotta cheese. From a qualified Iitalian chef. what do you use for “buttermilk”? buttermilk available to me is a concoction of other items not exactly what i think of as buttermilk ? skaterina – In the absence of cultured buttermilk, I think kefir should work just as well. Do you have that in your area? I didn’t use cultured buttermilk, I used the buttermilk from making my own butter. So I’ve made something creamy and sweetish- but not cream cheese. Any idea what I’ve made and can I use it for anything? Seems a waste to just throw it out. So what is a”nonreactive” pot? A nonreactive pot is one that is made from materials that don’t react with acidic ingredients such as stainless steel, ceramic, or glass. Anything coated with enamel works also. Copper and aluminum, on the other hand, are reactive. Auntie – Yes, but not by much. You can increase the amount of whole milk and decrease the amount of cream to lower the fat content. I’ve made one batch with 50% milk and 50% cream once and it was good. I wouldn’t go below 50% cream, though. As for the buttermilk, as you may already know, it’s already low in fat despite the name. You make rennet sound like it isn’t scary at all! The recipes I’ve read before for cheeses with rennet seemed very worried about how long you let it act for before you stopped the reaction, but overnight sounds nice and relaxed. Rhoda – Yes. Chef Michaud’s original recipe actually calls for powdered rennet. He mixes 2 grams of powdered rennet with 40 ml (which is about 1.4 fluid ounces) of cold water before adding it to the cream mixture. I think I really messed up your blog, I am sure about six post went on, didn’t think I was doing it correctly. Sorry. That looks great. I’m going to try to replicate this over the holidays. At last a straightforward recipe! I’m trying this RIGHT NOW (with a few tweaks to allow for transatlantic translation etc.) Thanks. 1 2/3 cups warm water. can i replace the yeast and water with the fresh whey from this cheese recipe? thanks, leela! i take it i still have to use the yeast my bagel recipe calls for, right? is there such thing as using too much yeast…surely. Emily – Yep. I’d stick with the same amount of yeast. To the commenter who posted this question: “can there be any substitute for rennet? citric acid or lemon, anything which is readily available. I have never tried that, but I have a feeling it will work to a certain extent. This recipe, in my opinion, produces — for lack of a better way to describe it — very similar to Philadelphia cream cheese, only better, fresher, and creamier. With citric or tartaric acid, you may end up with a cheese that’s runnier and perhaps more grainy. The first problem, I suppose, can be fixed with longer straining time. The other problem (if it occurs at all) might prove to be something so minor that you can live with, especially with the benefit of not having to hunt down rennet which can be hard to find in some area. Would you experiment with this and come back and let us know? Thank you. My understanding from this link is that Kraft Philadelphia Cream Cheese does not have rennet. Are you indicating that is not correct? Are any changes necessary when using “raw / fresh” milk? The kind of milk straight from the good ‘ole cow? I mean, do I still need to separate the cream from the milk, or can I just get started with it all still together? The milk straight from the cow, unpasteurized or not, contains 3.5% butterfat, if it is from the most common type of black & white cow derived from the and up to 5.5% butterfat from excellent Jersey cows. So, the milk portion that Leela suggests, will contain 3.5% fat and say 10% Solids Not Fat. A portion of these two solids will be retained in the cream cheese and some will escape with the whey. Now, the CREAM, or heavy whipping cream required, is a separate liquid which is 35-40% butterfat, or TEN TIMES that of regular milk. 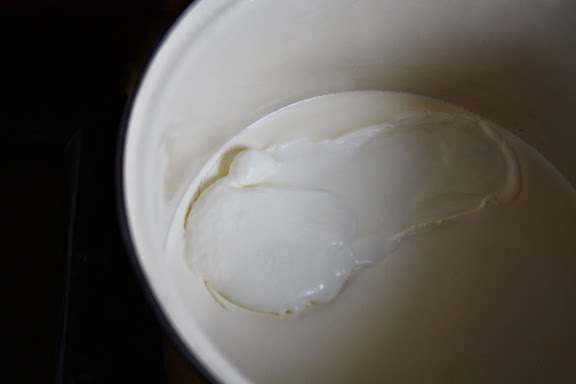 Regular milk is left to stand in cool temperatures [traditionally] and the fat floats to the surface after a while where it is skimmed off along with a bit of the milk. This is what is called your whipping cream or heavy cream. 1. Regular milk with the lower fat content plus some milk solids which will give body to the cheese. 2. Heavy cream, which will add the CREAM in the CREAM CHEESE! Your question seemed to be : Can you use only the fresh milk and avoid adding the heavy cream? The answer is you will get cheese curds of some sort to be sure, but you will certainly NOT get CREAM CHEESE. There was someone upthread who used acids like lemon juice etc. and spoke of raising the milk temperature just short of boiling. At 80C and above she would have produces chhAna, a type of casein highly regarded in India and Bengal in particular. Whatever she ate was tasty chhana and by no means cream cheese. By disregarding the recipe one encounters a situation like this: I inherited my great-grandfather’s knife; my grandfather changed the blade and my father changed the handle! Lisa – I’m sorry. I have no clue. Does anyone know? Hi, how much cream cheese did you get from this recipe? Tracey-Ann – Thanks. This should have been included in the recipe, but, for some reason, was left out. This yields about 1.5 lbs. @ Leela- Can vegetarian rennet be used instead of Veal rennet?? Will it be as effective?? I use vegetable rennet and it works just fine. Vaibhav – I have never tried it, but I would say so. A soft cheese like this is pretty easy to set. I have a question. Are you using homogenized, ultra-pasturized (store-bought) milk and dairy products, or are you using a less-processed source? I saw nothing in the comments above about this. Laurie Marie – Everything I use is regular, store-bought stuff. No doubt fresher, less-processed ingredients will result in better tasting cheese, though. But in terms of the ability to coagulate and all that, store-bought stuff works just as well. Hey I was wondering how long the cheese is good for? Anon – About a couple of weeks in an airtight container, refrigerated. so i made a test run of this and it turned out perfect. Now i’m making my second batch and it has not turned to curds like the first one did and i’m using the same exact ingredients i used the first time. any suggestions? can i add more rennet and let it sit another night? Anon – Sorry, I didn’t get to this comment sooner. I’m not sure what the problem might be, and I’ve never had this happen to me. I’m tempted to say you should do exactly what you’ve proposed, but I really don’t know how safe it would be to leave the milk at room temperature for another night. What did you end up doing? Did it work? Where do you buy veal rennet? Are there different kinds of this rennet? Is veal necessary? Does it add a flavor? If I find rennet in my market, and there is no veal, can I use another one? Thanks! Dale – Yes. No, but veal rennet tends to result in better, firmer coagulation. No. Yes. Junket makes rennet-you can find it in the pudding section in most supermarkets. It has a recipe book in there with easy starter recipes. I usually make hard cheese-Colby to be exact. Today was my 1st shot at cream cheese. Should be interesting to see how it comes out. Thanks for very interesting recipe. How would it work without adding cream nor butter milk ? Just with milk? Then why heat the milk at 21C and not 32 which is a more common temperature for the rennet to act? And last, would not the cheese drain better outside of the fridge, at room temp?? Thank you, I think I should get that book… What other recipes does it hold ?
. Without buttermilk, there’s no culture and you won’t get the tang. As for the temperature, I have no idea. You may want to contact Chef Michaud at gregoiremichaud.com for clarification. Leela, how about mascarpone ? I am guessing that it could done with cream minus the milk ? Commercial mascarpone is quite pricey so there would some economic incentive to do it at home ( apart from the taste and organic aspects ). I LOVE this cheese!! It’s wonderful. I made mine with fresh raw milk. If you pasturize (or I just scald it) it lasts longer. And yes, you can use vegetable rennet. It’s usually twice as strong. Thanks for your wonderful recipes. What’s the consistency of this cream cheese recipe? I live in Germany and only the spreadable version of cream cheese is available here. I’m looking for the brick version like in the U.S., a cream cheese that is spreadable at room temperature but hard when refrigerated. halfjapanese – When it’s fresh (up to 24 hours), the consistency is like that of cream cheese spread. If you’d like it to become thicker somewhat like the brick version of Philadelphia cream cheese, simply strain it by wrapping the cheese in multiple layers of cheesecloth, placing the whole thing on a colander set over a bowl, and leaving it in the fridge like that until the cheese has the consistency you want — maybe 2-3 days. Keep in mind, though, that even strained cream cheese won’t have the exact same texture as that of Philadelphia. It will be close, but not identical. This is due to the absence of the stabilizers (guar gum, locust bean gum, xanthan gum, etc.) that are typically added to commercial cream cheese. Some of mine and my husband’s favorite cheeses are made with a combination of goat, cow and sheep milks. So, strictly for flavor purposes, I’m really interested in trying this with goat milk substituted for the whole milk, while keeping all the other ingredients the same. Has anyone else experimented with this? Should I expect anything else to change except the flavor? Meredith – It works.I tried that a few times. I’m a late starter with making my homemade cream cheese. Just tasted mine 5 minutes ago and WILL be making this often !!! I did increase the buttermilk by accident and loved the slightly sour taste ! TY again for, yet another, great recipe ! I made this this week and it tastes like sour cream. Is it supposed to tasted that way? Kerry – It’s cultured, so it’s supposed to be tangy. However, if the end result is too tangy for you, I’d reduce the incubation time by half next time. I ended up using that batch as sour cream. I made it again and lessened the incubation time. It was perfect. Wow that’s very nicely explained. However I have doubt about buttermilk. In India we refer buttermilk as (watered yoghurt). However in other parts of world buttermilk is referred as milk+acid(citric/vinegar) mixture. Which one shall I use? this is my first experiment to cheese making so I am playing safe by choosing following measurements, do you think it will do the job? Vinit – Between the two, I’d go with yogurt that has been watered down. You want the culture. I think your ratio may work. Without rennet, the cheese may not set very well. But if you strain in for 1-2 days in the fridge, it will get firmer. Just pour the cheese mixture (after it has been incubated) into a cheesecloth- or large coffee filter-lined colander set over a bowl and refrigerate. Thanks, I shall keep these tips in mind. I was just worrying that refrigeration might affect draining whey. I tried again and still wasn’t quite right. Can you give me an idea of how long you let it incubate? I don’t think I did long enough. And mine doesn’t look like your picture after a day of draining in the fridge. It is still pretty runny. Kerry – Around 10-12 hours. What kind of rennet are you using? Regarding the cheese being runny, don’t throw it out. Just let it drain another day or two. Thanks for your help. I’m using vegetable rennet. Thanks for all your help! I have had success! I have to let mine drain for 3 days and I put something heavy on it on day 3. This is really cool! I’ve never really found a tutorial for how to make your own cheese before, not that I’ve been looking…however, I am intrigued and I want to give it a try, after looking at your pictures and post. The closest I’ve come to making cheese is double straining Greek yogurt through coffee filters…which essentially just removes moisture. Awesome write up, thanks so much for sharing the inspiration! This question may have been answered in previous comments, but I’m a total newbie to cheesemaking (never done it before!) so I’m being prudish. Does the type of rennet make a difference (junket rennet, liquid vs. tablets, vegetarian) and does the measurement need to be adjusted depending on the type? Thanks a bunch, your posts are fantastic! Anon – To be honest, I have never experimented with various types of rennet and compared the results. Liquid veal rennet has been very effective and I’ve been using that consistently. If anyone’s who reading this has more experience than I do, please share. Hi I was wondering if this would be good for making cream cheese icing I’m concerned about the consistency but really would like for my icing to be completely homemade what do you think? Anon – I’ve made cream cheese icing for my carrot cake with the cream cheese I made using this recipe before. It worked beautifully. You just might need to let the cheese firm 1-2 more days in the fridge. When it has the consistency of Philadelphia (without the glossy, gummy feel from the added gum — if you know what I mean), it’s ready. Hey! Sadly, rennet is not available at any of the super markets in my region. Can I use lemon juice instead? And how much? Also, I don’t have a thermometer. When am I supposed to take the milk and cream mixture off heat without having to check its temperature? Anon – Sorry. You can’t. I mean you can, but you’ll end up with grainy farmers’ cheese- or cottage cheese-like texture. Anon – As long as the milk and cream mixture is no longer cold and at room temperature, you’re okay. You shouldn’t boil it. It just needs to be brought to room temp or slightly lower. Oh okay so it’s not possible to make cream cheese without rennet? Anon – I’m afraid not. Chef Dan – Thank you! Those who can’t find rennet in their supermarket, have you explored online sources? Dairy Connection Inc is where I get mine. New England Cheesemaking Supply is also a good source. heyy!! Great recipe… Havent made cheese before. Though again i had the same problem… No rennet… And i was too impatient.. Wanted to try it out anyway!! So i used the proportions one of your readers suggested (vinit). But i used citric acid instead of lemon… Its come out pretty thick… Its in the refrigerator.. Drainin away… Fingers crossed!! 🙂 ill let u kno how it goes! Hi, I’ve searched so greedily the cream cheese recipe, I can’t find this in my town. Your recipe is really awesome!!! I want to try it but I can’t find buttermilk here, so can I just use milk with vinegar to make buttermilk? Use yogurt. You need the culture. Could be that some recipes aren’t meant to be scaled down, especially ones that deal with live culture. I’d try following the prescribed measurements first. Sorry, Greg, I have no clue. Does anyone know? can we use sth else instead of rennet? I have no idea. Would you like to experiment with the rennet-free method and let us know whether you can produce chèvre-style goat cheese that way? Thank you. I have tried this recipe twice now, and the cream/milk/rennet mixture has not hardened overnight at room temperature either time. When I check it in the morning it is still completely liquid. Do you have any tips or ideas as to why this might be happening? That’s weird. I can’t think of anything. Perhaps it has to do with the kind of milk you use? If it’s ultra-pasteurized (UHT), that could be the culprit. Anyone want to help me and Marissa out? Finally I found the recipe I have been searching for. I have a couple of questions I hope you may be able to answer though. Your recipe only uses 2-3 drops of rennet while other recipes require 1 ml per litre milk. Is there any harm in adding more than the recipe says? Secondly I saw somewhere you mentioned “cultured buttermilk” while the recipe doesn’t. After making my own butter I am left with buttermilk, is this ok to use or should it be store bought? Charlotte, first of all, the reason the recipe is the way it is is because I’ve used it with permission by the original author. Also, I’m wondering whether my using veal rennet from a source specialized in cultures and rennets makes a difference. I don’t think there should be any harm in adding more than the recipe says, though. As for buttermilk, the kind you get from the store (cultured buttermilk) is different from the byproduct from butter making, even though both are casually called ‘buttermilk.’ You can read about it here: http://en.wikipedia.org/wiki/Buttermilk Regardless, you need the bacteria in cultured buttermilk for this cheese. Can Rennet tablets be used if the liquid can not be found….? I would think so, although I have never used rennet tablets (which means I have no idea how many tablets are equivalent to the amount of liquid rennet the recipe calls for). Making this tonight hoping it will be ready by Thanksgiving. My mom LOves Cream Cheese but is allergic to Gums…so homemade cream cheese is the way to go..Only problem is i do recall that the heavy cream was probably Ultra pasturized. I hope it works. How long does it take for the mixture to set? 8hrs? 24 hrs? Ultra-pasteurized cream should still be okay. It usually takes 10-12 hours for the cream mixture to set. I usually let it incubate overnight. Do you think you can help with coming up with a cow free recipe? I can find goat milk but the cream and buttermilk make finishing the recipe impossible. Most cream cheeses for dairy intollerant people are stacked with additives and preservatives – I would love an alternative! I can’t think of a way to do this unless you can find heavy cream and buttermilk that are made of goat milk. Anyone want to offer a suggestion? One thing I do know is that it is very hard to get cream from Goats Milk so I suspect that cream and buttermilk of this variety doesn’t exist. I do have access to Sheep, goat and buffalo yoghurt but I imagine they wont give me the desired affect! I wonder how it would go if I skipped the rennet and used a thick mild natural yogurt (of the kinds described above). Do you think it would be worth giving it a go? You won’t get cream cheese without rennet. What you’ll end up with just diluted yogurt. 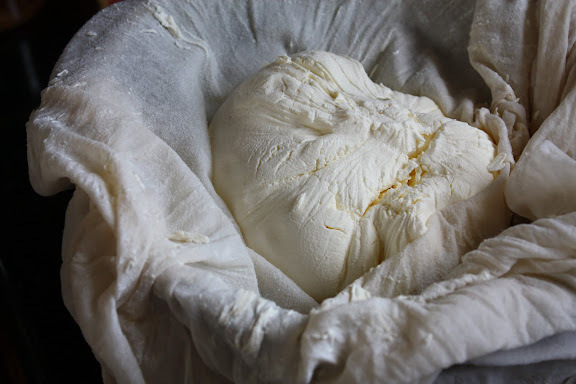 After you strain out the whey, what remains is homemade yogurt cheese. This means that if you might as well take some of the sheep, goat, and buffalo yogurt (lucky you …) and strain that in a coffee filter-lined colander in the fridge for a couple of days without having to go through this process. Hi there. I’ve been searching for a great cream cheese recipe and I can’t to try this one. However, I can’t get cultured buttermilk, but have sachets of mesophilic bacteria starter in the freezer. Would that work just as well? It might. Would you please try and let us know? It will work. Think of mesophilic bacteria as those that make buttermilk while thermophilic are the ones in thick yogurt (require higher temperature in the range of high 30 to 40 deg C). I just tried this recipe ,and my family loves it. I had to add extra acid to get it to come together, but it tastes great! I turn my sour cream,yogurt etc upside down in a dish[in case it leaks] it lasts almost forever. Till you get to use it up. Do you or anyone have a recipe for lactose intolerance. Kaydee, regarding lactose intolerance, there are degrees of intolerance. Yogurt is said to be good for most LI people because the process of culturing it causes the bacteria to consume most of the lactose. Not all commercial yogurts are properly cultured, some are little more than a milk jelly, and include gelatine! 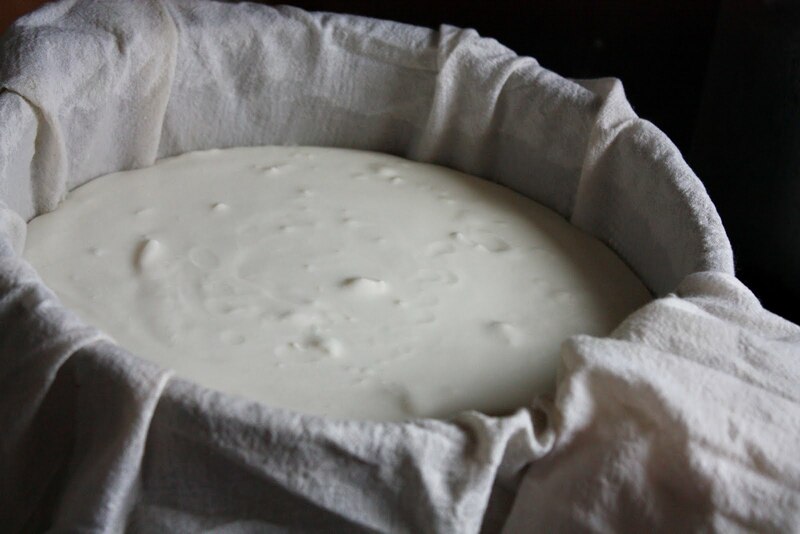 But if you simply make homemade yogurt, then filter it using fine cloth for a day or two, in the fridge, you will have a yogurt cheese, and it should be acceptable to most LI people. It will be a bit tart, as it’s just dried yogurt. If you follow the cream cheese recipe, using rennet but omitting the cream, you will end up with a more cheese-like product. I basically don’t know whether yogurt bacteria will turn the cream content into low lactose (if indeed cream contains much lactose), but I expect it may. I think you should go ahead and follow the recipe here, and see whether the LI person can tolerate it. But try with a small portion first. Probably the same amount as buttermilk. I have never tried this method. I stumbled upon your blog while looking for a good recipe for cream cheese and I’m hooked! Thai food and traditional French methods in one place… you’re a woman after my own heart! I’m reading this all with such interest! I’m in Kenya and the ‘cream cheese’ here is very expensive and most are not even good! I have access to citric acid. Anyone who used this to good result care to let me know what the quantity was? I love to cook, but chees, etc. making is v. new to me! Hope to be making cream cheese – and cheesecake soon! I was wondering if this kind of cream cheese can be baked as well? Ann, yes it can. I would let the cheese dry out a bit longer in the fridge until it gets as thick as commercial brick cream cheese before using it. Delighted to find this..I make my own yougurt in my crock pot two times a week, and it is so much yummier than store bought. Just wanted to let you all know that I use paper towel to drain the whey off the yougurt….and it work very, very well. I can’t wait to try this….Thanks for posting! I made this with fresh goat milk, and half & half (cream was so expensive…) and it turned out AMAZING! Thank you so much for sharing this recipe. Hi. I’ve never made cheese before. Can you clarify on whether citric acid can be used instead of rennet? Also, can extra thick coconut cream be used in this recipe? I’ve tried to make this twice now. The first time, I didn’t have buttermilk so I used yogurt. I also have only junkett tablets. It took 3 days to solidify, but turned into great tasting cream cheese. The second time, I made a much smaller batch and it basically took 5 days to solidify and I don’t think I will eat it since it is probably bad. It looked sort of grainy. This smaller batch used buttermilk. The room temperature was around 68F. I have a feeling that 70F is not hot enough to sit at. I have a fermentor that will let me set it to any temperature that I would love to be able to use to make this turn out better. Maybe I should just spring for some actual rennet? Also, what is the point of heating the milk if it will reach the room temperature eventually anyway? I made homemade quark cheese. Same general.idea as this only.using all buttermilk. Done it before and it turned out great if a little flavourless. This time howveer it tastes really sour! Like its been drenched in lemon juice or something. Any idea how to lessen the sour taste? Ashtyn – Being cream cheese and not quark, it should have some tang. But if it tastes very sour like it’s been drenched in lemon juice as you’ve described, then something’s wrong. If you started out with fresh, unspoiled products and followed the instructions exactly as written, I have no idea why that is. So i tried this…had to strain it a bit longer and it set (but probably could have set more at first), now fully drained it just tasted like semi-hard whipping cream :/ any suggestions? First of all, thank you thank you thank you!! I tried your recipe as I just LOVE cream cheese, and, although I pretty much made a giant hash of it, it worked! For anyone interested, I didn’t have rennet so used junket powder. This is a big no-no, I have since found out, as it can make the cheese taste bitter. However, I was lucky. Then, I didn’t have buttermilk, so used a dessertspoonful of Greek yoghurt and one of sour cream; well, why not? I thought. I’m not sure I heated the milk/cream mixture enough as I didn’t have a thermometer. (Used the baby bottle test method, lol) and the curd didn’t get very firm. Oh, and i forgot the salt….added it after the straining. And yet, in spite of everything, it turned out just fine, though I strained it for longer. Lovely!